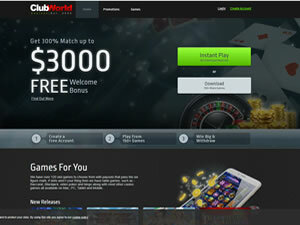 Club World Casino Review - Is Club World Legal For US Players? If you are looking for an online casino that has a ton of great games, is highly trusted, highly rated, and accepts players from the United States, then Club World Casino is your spot. Club World has been in operation since 2004, and in that time, this one has become one of the best legal online casinos accepting U.S. residents. There are a lot of things to like about Club World Casino and LegalCasinosUSA.com is going to recap those details for you here. The first thing that you will want to do in order to play at Club World will signing up and creating an account. This can be easily done by downloading the required software to install to your computer - which only takes a very short period of time. From there, creating a login and password for your account will be among the first items on the to-do list. Also, basic personal information will be required, along with verifying that you are legally of-age to play for real money. After creating the login and inputting the information asked of you, your account will be good to go. Now all it needs are some funds. Club World casino accepts players from the United States, and as such, has a couple of ways in which U.S. players can make a deposit into their account. A credit card, such as a Visa or MasterCard, are accepted methods to fund your account. A minimum deposit of $21 is required, up to $1,000. These transactions are instant, and read just like any purchase you would make with your credit card at a store. Credit card deposits are the most common form of funding made at an online casino. These transactions are very safe and secure. A casino bonus will be prevalent across the board, no matter which online casino you choose. When it comes to Club World, up to a $777 bonus on a first deposit for slots using the bonus code BIGSLOT is available. A bonus code is the term used for plugging in a code when making a deposit into your account. The on-site cashier will ask if you want a bonus, and to input the bonus code for the bonus desired. In this case, it's a 100% match up to $777. There is another form of this welcome bonus available that includes a 100% match bonus good for up to $150 in freeplay on table games using the code NEW100. Outside of the initial bonus offers, there are daily and weekly bonuses offered a Club World as well - which obviously vary during the year. But one thing's for sure, and that is that there are no shortage of great bonus offers at this casino. Once you have funded your account and selected your desired bonus, the only step left is to play your favorite casino games! There are more than 120 awesome casino games at Club World. Play a variety of slots, or go to some traditional table games like craps, roulette or blackjack. In fact, before installing the Club World software, players can preview the games and check out what's offered. This will give prospective players the chance to view what the selection available is + the transparency is a nice feeling because Club World has nothing to his. Club World Casino Software - What's Under The Hood? Real Time Gaming software is the magic behind Club World Casino. RTG provides a very high quality gaming experience for all of their players, frequently rated as the best in online gaming technology. Club World is one of many RTG casinos around today. Receiving a payout from Club World is as requesting one. From there, Club World will respond within 24 hours for further inquiry. As a U.S. player, there are a few options to use. Club World will mail you a check, with a $350 minimum withdrawal requirement - but only takes a few days to get to you. A wire transfer is another option, which takes approximately five days to be received by the player. This comes from a Western Union transfer. There is also the choice of a bank wire. It's a similar withdrawal to a wire transfer taking five days as well. Call Club World toll free from the U.S. at 18-888-671-2855. There is also a live chat option right on site that will directly connect you to a customer representative, and they will answer any and all questions you may have. Also important to note is the fact that Club World has a Frequently Asked Questions section as well, which might answer your question without having to contact customer service.